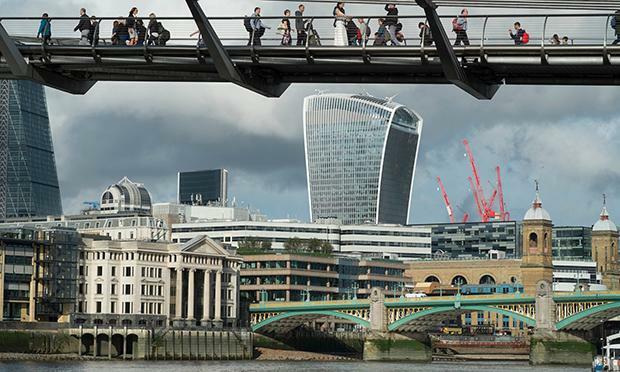 Described by Oliver Wainwright of The Guardian as the ‘bulbous comedy villain of London’s skyline’, 20 Fenchurch Street, more popularly known as the Walkie-Talkie, has been named worst building of the year and with it the honour of claiming the Carbuncle Cup by Building Design magazine. Since it was opened in 2014, the building has been found to have melted parts of a parked Jaguar motor vehicle’s exterior, scorching nearby shop fronts and creating gusts of winds able to knock people over. A journalist demonstrated the intense heat by frying an egg in a pan from reflected light from the ‘Walkie-Scorchie’. The 38-storey building’s convex, layered shape is certainly distinctive-- an eyesore to many—with higher floors having a larger floor plate than lower levels. The design was criticised by both English Heritage, declaring it an "oppressive and overwhelming form" and Unesco a "brutally dominant expression of commercial floor space". Architect Rafael Viñoly has admitted to making some mistakes with the building and was aware in the design stages that the curved façade would focus an intense beam of sunlight onto the street, but not to that level. Sunshade has been erected to alleviate the issue. This was actually part of the original design, but apparently according to Viñoly was “value engineered” out of the final form. Critics also argue the location is not even suitable for a large tower with neighbours having fought hard against its construction due to light issues. It also dominates over the Tower of London and has upset heritage boosters. However, city planners welcomed the building and its promised public space, a sky-garden with a viewing platform. This of course has been panned as being too costly, requiring advance booking times with visitors being subject to airport-style security. The Walkie-Talkie was the most nominated structure for this year’s Carbuncle Cup with some suggesting the running was not even close. The Carbuncle Cup for the worst designed building in Britain got its name from a 1984 speech by Prince Charles where he called a proposed extension to the National Gallery a “monstrous carbuncle”.